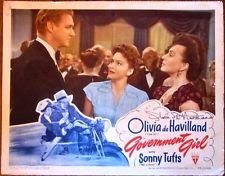 GOVERNMENT GIRL (1943) is an early entry in a string of mid '40s comedies about life in wartime Washington, D.C. It's a brand-new release from the Warner Archive. 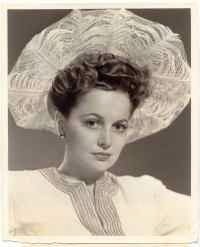 The title role is played by Olivia de Havilland; she stars as Elizabeth "Smokey" Allard, who's assigned to be the secretary to Ed Browne (Sonny Tufts). Browne is newly arrived in the nation's capital; he's a manufacturing whiz charged with increasing production of bombers. The can-do Browne is frustrated by Washington bureacracy -- a theme which remains timely today -- and Smokey helps him navigate his way through alphabet agencies and social events despite their relationship initially getting off to a rocky start. Smokey is romanced by too-slick Dana McGuire (Jess Barker) and newsman Branch Owens (Paul Stewart), but without realizing it she's gradually fallen under the spell of her big teddy bear of a boss, Mr. Browne. GOVERNMENT GIRL is a bit of an oddity. It's not a bad movie -- indeed, it fully held my attention and for the most part I kind of enjoyed it -- but one has the sense throughout that it could have been quite a bit better. Most of my discomfort with the film was due to Olivia de Havilland's performance. She's such a fine actress I have truly loved in so many films, especially THE ADVENTURES OF ROBIN HOOD (1938), GONE WITH THE WIND (1939), and HOLD BACK THE DAWN (1941), that it's hard to know what to make of her acting in this one. It's extremely broad and at times almost disinterested; she seems uncertain how to play comedy and not entirely happy about trying it. Curiously enough, after the movie was over I read in a couple of places that de Havilland hadn't wanted to make the movie, done on loanout to RKO, and her performance was the result. It's hard to imagine an actor wanting to self-sabotage one's career but perhaps that's the explanation. By film's end her character has become more likeable, as she warms up to Mr. Browne, but it's simply an odd film for her, and it doesn't help that, other than a shimmering evening gown, she's poorly dressed. By contrast, the very same year she gave a glowing, lovely performance in the charming romantic comedy PRINCESS O'ROURKE (1943), where she looked stunning and gave her usual outstanding performance. Tufts, who also starred that year in Paramount's SO PROUDLY THEY HAIL (1943), is pleasant if not particularly memorable. To date I have liked him best as a football player in Jacques Tourneur's EASY LIVING (1949), an excellent film which coincidentally also costarred Paul Stewart. Stewart is one of the more appealing characters in GOVERNMENT GIRL. Anne Shirley is fun as Smokey's dizzy roommate, who marries the (considerably older) Sergeant Blake (James Dunn), but they can't find a hotel room for their honeymoon. Agnes Moorehead is a stitch as a perpetually hair-patting, self-important D.C. society matron. The excellent supporting cast also includes Harry Davenport, Sig Ruman, and Una O'Connor. I was on the lookout for Barbara Hale in a bit role but didn't spot her, and apparently I also didn't notice Lawrence Tierney as an FBI man! Watch for Charles Halton, Ian Wolfe, Jane Darwell, and Emory Parnell in small parts. 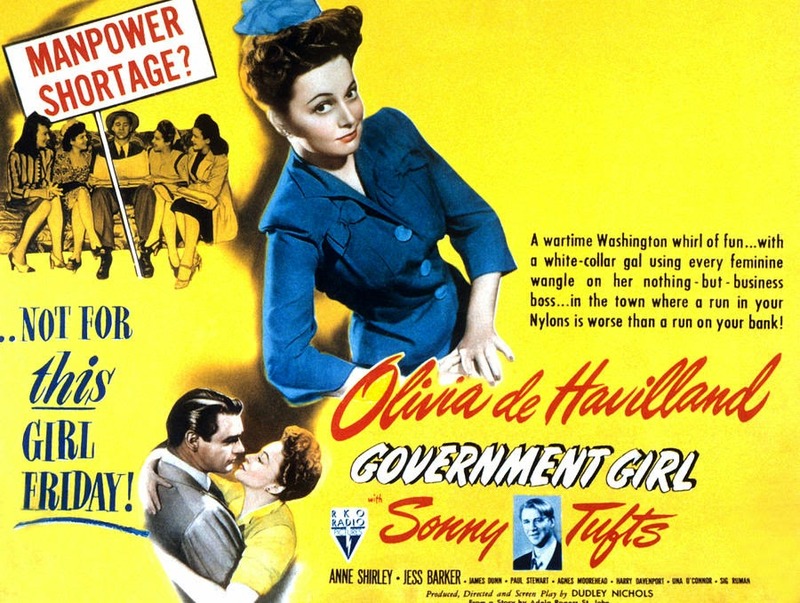 GOVERNMENT GIRL was written and directed by Dudley Nichols, based on a Budd Schulberg adaptation of a story by Adela Rogers St. John. 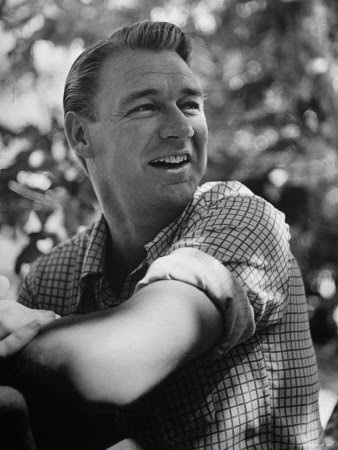 The movie was filmed in black and white by Frank Redman. GOVERNMENT GIRL was released just days after the far superior wartime Washington film THE MORE THE MERRIER (1943), which starred Jean Arthur and Joel McCrea. The following year there were several more comedies focusing on the D.C. housing shortage or wartime work, including THE DOUGHGIRLS (1944), STANDING ROOM ONLY (1944), and JOHNNY DOESN'T LIVE HERE ANYMORE (1944). 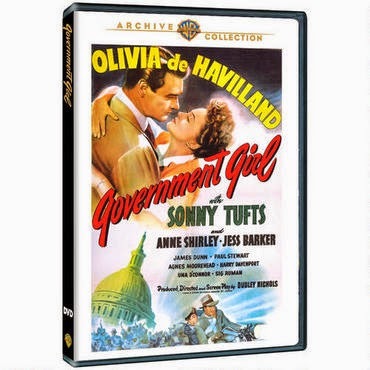 GOVERNMENT GIRL is one of several recent releases from the Warner Archive starring Olivia de Havilland; I've also reviewed WINGS OF THE NAVY (1939) and anticipate reviewing GOLD IS WHERE YOU FIND IT (1938) sometime in the next couple of weeks. Despite some negative comments above, I still had a pleasant time watching GOVERNMENT GIRL, as I enjoy films about wartime Washington. The GOVERNMENT GIRL DVD is a good print. There are no extras. Thanks to the Warner Archive for providing a review copy of this DVD. Warner Archive releases are MOD (manufactured on demand) and may be ordered at the Warner Archive website.